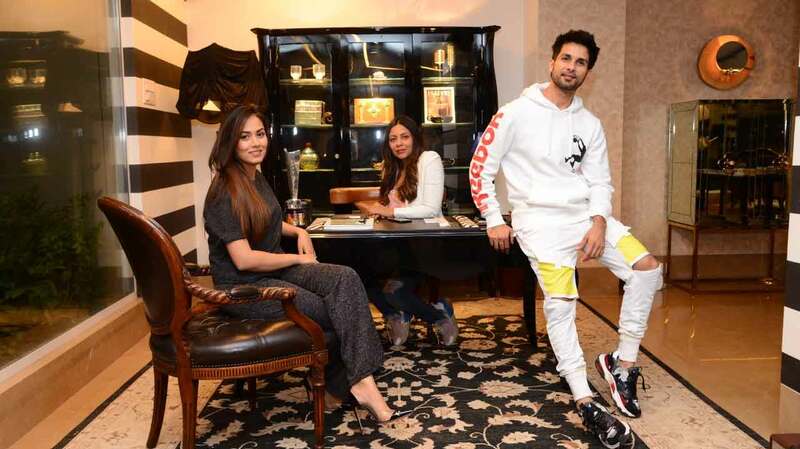 Recently, actor Shahid Kapoor and his wife Mira Kapoor visited the lavishing 360 degree home decor store in the suburb. Shahid Kapoor had seen making goofy videos while checking out the spectacular collection at Gauri Khan store which is premium store in the city and the one stop shop for all the B-Town stars. As the couple visited the store, Gauri Khan took to her official Instagram handle and she posted some videos and pictures featuring Shahid and Mira. Gauri Khan captioned the picture of three of them, “‘ Jab We Met’ Mira and Shahid at #gaurikhandesigns. All grace and charm. @mira.kapoor @shahidkapoor”. Gauri Khan’s flagship store situated in Mumbai is a hit among Bollywood celebrities. From Aamir Khan, Aishwarya Rai Bachchan and Abhishek Bachchan to Ranbir Kapoor and Alia Bhatt, many Bollywood celebs visited her store and wished Gauri for her future endeavours. Moreover, Mrs. Khan has even designed homes of many celebs like Ranbir Kapoor, Sidharth Malhotra, Jacqueline Fernandez among others. Gauri Khan had seen greeting the couple and having a good time with them as she made them introduced to the luxurious collection at her flagship store. The videos and pictures are getting viral as the actor Shahid Kapoor and Mira Kapoor visited the Gauri Khan Designs Store.